Chicken Tikka with Zesty Relish-Infused Rice & Cucumber Salad (serves 4) | Crappy Kitchen - Good Dinners! I was getting a little weary of “winter-y” type food and so last night decided that our dinner had to remind me of the sunnier days ahead. I know it is only January but when I turned the page on the calendar I immediately started thinking about Spring and what I wanted to plant in my garden this year. Herbs came to mind and then I longed for something FRESH! Here is what I came up with! chicken tikka with relish-infused rice and fresh cucumber salad – So darn good! Tikka is from Indian and Pakistan but when I think about Tikka I am reminded of the great popularity this type of dish has enjoyed in London and countrywide, resulting from the British Raj that began way back in the mid 1800’s. As conservative as the food is in England (up to lately anyway) unbeknownst to them, they were at the forefront of the trendy “fusion” movement, combining their foods with that of India, Pakistan and Bangladesh. The tikka refers to a type of cutlet and in general it means a piece of meat (chicken comes to mind), that is easily skewered on a kebab. But, tikka comes with the possibility of a great masala (this is the word for “curry” in India) or some sort of spicy fresh marinate that is bound together in a yogurt base. Yogurt (and sour cream) is a great partner of anything spicy because it cools everything down and gives nice balance to a dish. Chicken Tikka Masala is one of the most popular dishes in England. A BBC statistic reports that at least 18 tonnes of chicken Tikka Masala is eaten across the country each week, served by Britain’s more than 15,000 Indian restaurants – now if only they could double that number and get rid of places like McDonald’s it might help their growing obesity crisis! Limes make this relish pop with zestiness! 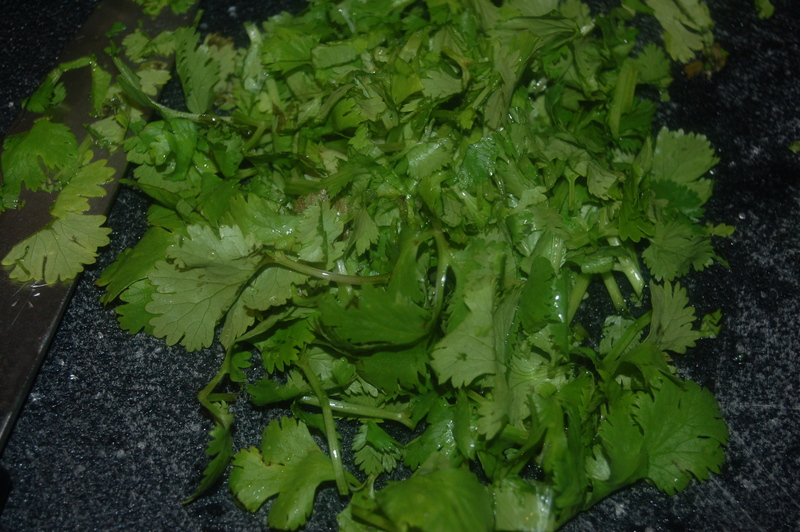 It was so refreshing to be zesting limes and chopping cilantro. I figured if I made the kebab, rice would be the obvious accompaniment. I decided to add lots of the relish to the rice to make it interesting and colorful and it was perfect for mixing into the diced cucumbers also. When I made this I realized all of the possibilities with the relish and cucumbers and how these little side dishes could be mixed in or served with so many other things besides the kebab. The kebab marinade is pretty standard and I know for sure there are many variations according to tradition and what you have available. Pretty much any spice mixed with the yogurt and lime juice would work so don’t limit yourself to my recipe. I have a feeling that this recipe will prompt many more Tikka-inspired dishes in the near future, so watch out! Oh, and forgot to say that there wasn’t a scrap of food left on anyone’s plate after dinner – says it all right there! Cooked Basmati Rice (stove top: 2 cups rice and cook according to package instructions OR Rice Cooker: 3 cups rice-cooker measure and cook according to the instructions of your rice-cooker). The chicken is cooked on skewers and you can do one of two things: use metal skewers or use wooden skewers. If you use wooden skewers you will need to soak them in water for at least an hour before using. This stops them from burning up on the grill whether on the barbecue or under the grill in the oven. 1 – When rice is cooked add 3/4 of the relish and mix together. 1 – Toss diced cucumber with 2 tbs of relish – taste for addition of salt. set aside (can be made ahead of time and stored in the fridge. Drain off any excess liquid before serving. 2 – Grill chicken and remove from skewers (or leave on skewers for serving). Chicken will cook in 4 to 6 minutes per side. This entry was posted in "Blood Type A " Recipes, dinners and tagged Blood Type A diet, blood type A dinner, blood type A recipe, bristish raj, chicken masala, chicken tikka, chicken tikka masala, cucumber, cucumber salad, curry, curry and rice, indian food in Britian, masala, tikka, tikka marinade, tikka masala. Bookmark the permalink.